Hello all Super Indian Fans! I thought I’d give you the ultimate behind-the-scenes tour of the process of taking an audio theater episode of “Super Indian” into a full comic book project. The first step was breaking down the radio script I wrote for “Technoskin” and expanding it to a 23-page comic. As most of you know, “Technoskin” just started running here on SuperIndiancomics.com and will take a few months to finish up. However, it’s taken most of the past 2-3 years to create the design and artwork for the comic book. It’s been a long-time dream for me to create a comic book character and ongoing stories. I used to do this when I was in school, but just didn’t have the drive (or the bucks) to go to art school and pursue a career in the comic book industry. I did keep drawing….and when the idea of “Super Indian” came into focus, I knew this was my chance. The story of “Technoskin” concerns the return of bad boy Derek Thunder and a giant metal robot to the Leaning Oak Reservation. Derek was the other kid who ate tainted commodity cheese and got super powers. Imagine him an indigenous “Lex Luthor” and that will give you an idea where this is all going. If any of you prospective comic writers out there own “Final Draft” software — there’s already a template for graphic novels. You can use their format to break down your ideas into words, images, then finally into panels and word balloons. The next step was to complete the entire script. Although it was helpful to have the radio script to work from, the original episode was only five minutes in length. Yep, had to fill-in a lot of backstory. There are some more characters that will come to life in “Technoskin” that I hope will make you laugh in recognition at. Also, I altered the radio episode to actually bring Derek back home to the Rez. In the radio episode, Derek worked with and used the magic powers of Wampum Baggs to power his robot. This time Derek uses his own powers to bring Technoskin to life. After I finished the full 23-page script, I took a graph-lined notebook and sketched out each page. This process is fun, creative but also a bit nerve wracking in that you have to factor in art vs. word balloons. 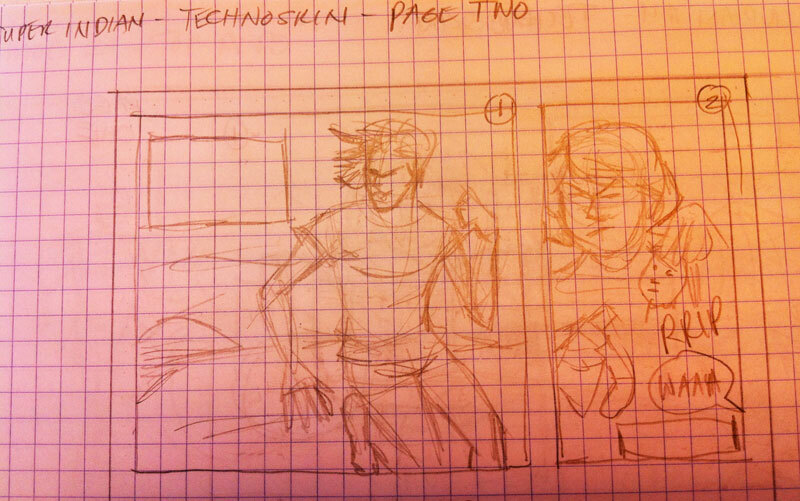 Here’s how the top of Page Two of “Technoskin” looks as a rough draft layout. Good layouts help when you’re ready to take these ideas to an 11 x 17 Bristol board. More on this process in the next post! We hope that helped! Now you have an idea why it takes her so long to get the comics out. AAAY! See you at the Phoenix Comic Con — May 24-27 at the downtown Phoenix Convention Center. See Arigon at booth #753-755 and at the Native Americans in Comics panel on Saturday, May 26 from 4:30-5:30pm. Next We have a PayPal link! !